How does chiropractic help me? Our center is specialized in resolving spinal and limb problems through Chiropractic treatment. We help to recover and maintain health by taking advantage of the existing relations between the nervous system, muscles, tissues and organs. All articulations of the human body are part of its musculoskeletal system and its proper functioning is necessary for the whole organism. Having the spine and nervous system examined regularly is essential for a healthy life without pain. Our Chiropractic Center aims to provide careful attention to each person and we will be happy to give you an attentive and personalized treatment. 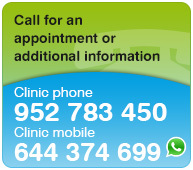 The Gregoletto Clinic has a qualified and experienced profesional staff. Patients can be confident that the treatment they receive will provide the best possible recovery. We are specialists in Chiropractic treatment of the spine and extremities. Our Chiropractic Center aim ..
Chiropractic Treatment can consists of adjustments to the spine and/or limbs, postural exercises, recommendations for home and work, kinesio taping. Chiropractic treatment consists of three stages: 1.Inicial Intensive Care: At this stage the main focus is to reduce sympt .. The Kinesio Taping technique uses a special elastic tape: the elasticity mimics the flexibility of human skin and muscles. The purpose is the treatment and prevention of muscle injuries, joint, neurological and ligament. The Kinesio Taping was developed by the chiropractor ..